Hideaway in Kelso, Scottish Borders sleeps 4 people. 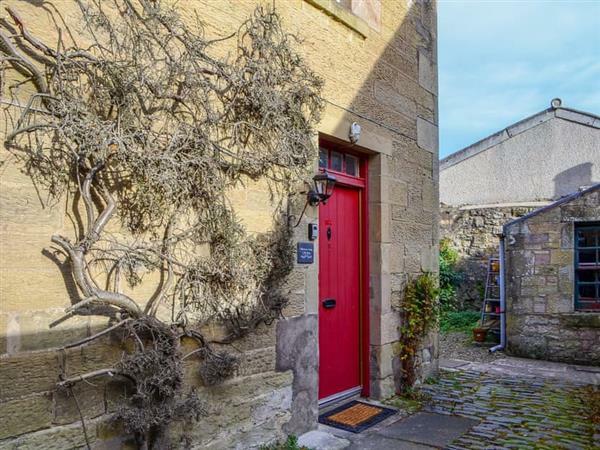 Hideaway in Kelso has plenty of space for two; this delightful, end-terrace cottage, in the heart of The Borders market town of Kelso, is set in a quiet area close to the old parish church. The very comfortable living/dining room opens into a well-equipped kitchen, and the spacious first floor bedroom is furnished in pretty shades, with both a bath and separate shower in the en-suite. Kelso has a wide choice of good pubs and restaurants with local retailers outnumbering the high street names. The town is on the junction of the Rivers Tweed and Teviot, famous for fishing, and has an ancient abbey, a graceful arched bridge which was the model for London’s Waterloo Bridge, and a charming main square at its centre, just a few minutes’ walk from the cottage. There are many historic houses and beautiful gardens to visit including Floors Castle, Mellerstain, Thirlstane and Bowhill. Enjoy wonderful walks and cycle routes throughout the area, with riverside and hillside options. During the year, many events take place at the Border Union Showground, along with racing, rugby and fishing locally. There is a beach 24 miles from Hideaway in Kelso. With the shop 220 yards, the pub is 385 yards and the restaurant is 55 yards from Hideaway. Living/dining room: With 24’’ Smart TV and single sofa bed (for flexible sleeping arrangements). Bedroom: With king-size bed and en-suite with bath, shower cubicle and heated towel rail (no toilet). Gas central heating, gas, electricity, bed linen, towels and Wi-Fi included. Enclosed garden with garden furniture. Bike store. Public car park, free of charge. No smoking. Holidays at Hideaway run from Monday to Monday. For a better idea of where Hideaway is, you can see Hideaway on the map below. Hideaway is in Roxburghshire; should you be on the lookout for a special offer, you can find all the special offers in Roxburghshire. It's always worth checking to see what is on offer at the moment. Do you want to holiday near Hideaway (UK5960), you can see other cottages within 25 miles of Hideaway; have a look to find your perfect holiday location.